We provide manufacturing services for complete turn-key leadscrew assemblies to your specifications. We can also assemble your custom products in-house to save you assembly time and costs in your manufacturing process. 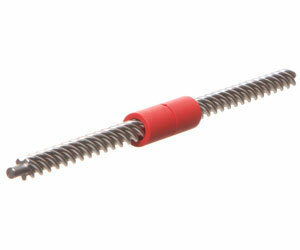 Consider contracting Noll to build your complete lead screw sub-assemblies. We’ll help you free up valuable time and simplify your logistics planning. Simply submit a Request For Quote with a drawing and we will respond with a competitive quote for your approval. Noll is a pioneer in modern high accuracy thread rolling. Our focus is supplying high tech industries with precision stainless steel lead screws. Thread rolling is a cold forming process that combines accuracy and superior surface finish with high strength. The roll forming process provides a cost effective alternative to traditionally cut or ground thread products. We offer precision CNC machining services for your leadscrew designs to save you time and ensure accuracy. We also provide precision CNC machining services for all of our standard products. Consider contracting Noll to manufacture your leadscrew designs to free up valuable time and simplify your process. Simply submit a Request For Quote with a drawing and we will respond with a competitive bid for your approval. If you have questions about our manufacturing, please call us at 805-543-3602 or click here to email. Teflon coating (Xylon 10-10) is an option on all of the Noll produced screws. Reduces noise on coarse pitches at high speeds. Enhances performance of Turcite X polymer nuts. Wear resistant even under extreme conditions. Weather resistant against sunlight, saltwater, and road chemicals. Allows wide operating temperature range from -250 to +285 C.
If you have questions about our coating services, please call us at 805-543-3602 or click here to email. Generally speaking, passivation is the process of making a material passive or inert in relation to another material prior to using the materials together. The primary purpose of passivation for leadscrews is to remove surface contamination such as iron particles that can foster rust and corrosion. The thread rolling dies and cutting tools can impart these contaminants and should be removed for optimal longevity and service life of your leadscrews. Removes impregnated metals out of threads. To ensure that machined parts have optimum corrosion resistance, they should be properly passivated. Passivation can remove sulfides exposed on the surface of free-machining alloys, which also may act as initiation sites for corrosion. Increasingly, citric acid passivation has become a viable alternative to traditional nitric acid passivation, particularly in the stainless steel industry. Note: ASTM A967 provides advice for the passivation of stainless steel parts. The conditions necessary for passivation are recorded in Pourbaix diagrams. Some corrosion inhibitors help the formation of a passivation layer on the surface of the metals to which they are applied. Passivation is not a scale-removal method. Any particles of oxide or heat tint must be removed before passivating. Passivate the lead screw to extend the service life of your motion drive assembly. If you have questions about our passivation services, please call us at 805-543-3602 or click here to email. Electropolishing, sometimes called reverse electroplating, prepares metals for plating, anodizing or conversion coating and improves surfaces for use in sterilization. The metal work piece is immersed in a temperature controlled bath of electrolyte and connected to the positive terminal (anode) of a DC power supply. The negative terminal is attached to a cathode to which the particles removed from the anode (the work piece) are attracted when electric current is applied. Often, the size, position and distance of the cathode to the work piece is controlled during the process in order to achieve the desired level of polish and to localize areas of polish. Prepares metals for plating, anodizing or conversion coating. Removes edge burrs produced by mechanical cutting tools. Removes the stressed and disturbed layer of surface metal caused by cutting, shearing, and tearing action of mechanical stock removal and abrasive finishing. Removes excess material as desired for milling metal parts. Improves surfaces for use in sterilization in the drug industry, surgical equipment, dairy and food equipment, restaurant equipment, missile and rocket parts. The process also passivates the surface of some steels by enriching chromium on the surface of the steel. This surface then reacts with oxygen to create the chromium-oxide layer which is the passive layer that prevents stainless steel from rusting. If you have questions about our electropolishing services, please call us at 805-543-3602 or click here to email.